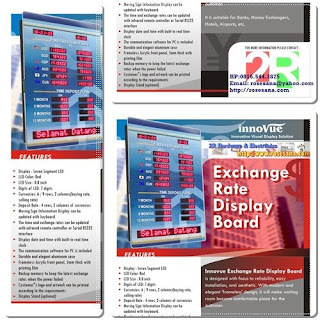 Electronic Exchange rate display board by Innovue is designed with focus and reliability. Easy installation and aesthetic. With modern and elegant 'frameless' design, it will make waiting room become comfortable place for the customer. Suitable for Banks, Money Exchangers, Hotel Lounge, Airport, business public ports, etc. Company's logo and artwork can customizable, according the request. SCi-BOX is the Science experiment tool set that contains the microcontroller main board, a wide variety of sensor modules, actuators, outputs with a display device and software tools. They work together to deliver new concepts in science experiments and add programming experiences to develop unique and creative technological scientific projects. Learn and experiment with various sensors and understand their individual behavior and operations. 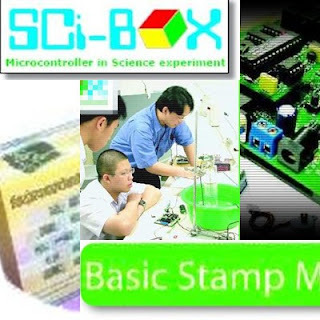 The SCIBOX runs on the BASIC Stamp2SX microcontroller. Learners can apply all knowledge to develop the new science experiment in different ways. The SCi-BOX controller board uses the i-Stamp microcontroller. This provides 8-Analog input for 10-bit A/D converter, 4-Relay driver circuit with a contact rating of 220Vac 5A, 2 DC motors and Uni-polar Stepper motor drivers, 7-Digital Input/Output port direct from i-Stamp with limited current resistance, a Piezo speaker and the Interface with a computer via the Serial port. This set also support USB to Serial port converters. 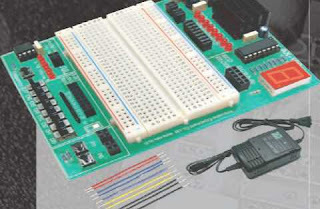 The economical digital circuit experiment board contains the nescessary tools for supporting the basic experiments. This is greatly suitable & affordable for young experimenters and all beginners. Breadboard 2.5 x 3.5 inches. 390 contact points. Includes : AX-1 board, manual, Wires, DC power adapter and some of Digital ICs for experiments. Optical fibers may be connected to each other by connectors or by splicing, that is, joining two fibers together to form a continuous optical waveguide. The generally accepted splicing method is arc fusion splicing, which melts the fiber ends together with an electric arc. For quicker fastening jobs, a "mechanical splice" is used. Fusion splicing is done with a specialized instrument that typically operates as follows: The two cable ends are fastened inside a splice enclosure that will protect the splices, and the fiber ends are stripped of their protective polymer coating (as well as the more sturdy outer jacket, if present). The ends are cleaved (cut) with a precision cleaver to make them perpendicular, and are placed into special holders in the splicer. The splice is usually inspected via a magnified viewing screen to check the cleaves before and after the splice. The splicer uses small motors to align the end faces together, and emits a small spark between electrodes at the gap to burn off dust and moisture. Then the splicer generates a larger spark that raises the temperature above the melting point of the glass, fusing the ends together permanently. The location and energy of the spark is carefully controlled so that the molten core and cladding dont mix, and this minimizes optical loss. A splice loss estimate is measured by the splicer, by directing light through the cladding on one side and measuring the light leaking from the cladding on the other side. A splice loss under 0.1 dB is typical. The complexity of this process makes fiber splicing much more difficult than splicing copper wire. Mechanical fiber splices are designed to be quicker and easier to install, but there is still the need for stripping, careful cleaning and precision cleaving. The fiber ends are aligned and held together by a precision-made sleeve, often using a clear index-matching gel that enhances the transmission of light across the joint. Such joints typically have higher optical loss and are less robust than fusion splices, especially if the gel is used. All splicing techniques involve the use of an enclosure into which the splice is placed for protection afterward. Fibers are terminated in connectors so that the fiber end is held at the end face precisely and securely. A fiber-optic connector is basically a rigid cylindrical barrel surrounded by a sleeve that holds the barrel in its mating socket. It can be push and click, turn and latch, or threaded. 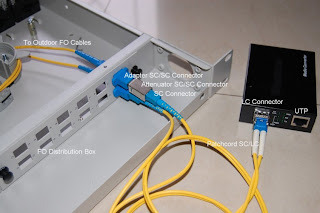 A typical connector is installed by preparing the fiber end and inserting it into the rear of the connector body. Quick-set glue is usually used so the fiber is held securely, and a strain relief is secured to the rear. Once the glue has set, the fibers end is polished to a mirror finish. Various polish profiles are used, depending on the type of fiber and the application. For singlemode fiber, the fiber ends are typically polished with a slight curvature, such that when the connectors are mated the fibers touch only at their cores. This is known as a "physical contact" (PC) polish. The curved surface may be polished at an angle, to make an "angled physical contact" (APC) connection. Such connections have higher loss than PC connections, but greatly reduced back reflection, because light that reflects from the angled surface leaks out of the fiber core; the resulting loss in signal strength is known as gap loss. APC fiber ends have low back reflection even when disconnected. The AL5A robotic arm delivers fast, accurate, and repeatable movement. The robot features: base rotation, single plane shoulder, elbow, wrist motion, a functional gripper, and optional wrist rotate. 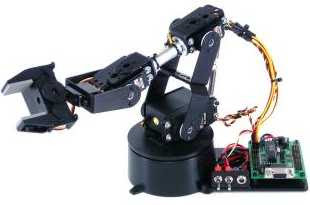 The AL5A robotic arm is an affordable system with a time tested rock solid design that will last and last. Everything needed to assemble and operate the robot is included in the kit, including RIOS, a very powerful Windows program for the SSC-32 servo controller. The aluminum robotic arm is made from our Servo Erector Set components for the ultimate in flexibility and expandability. The kit consists of black anodized aluminum brackets, Aluminum tubing and hubs, custom injection molded components, and precision laser-cut Lexan components. The arm uses 1 x HS-422 in the base, 1 x HS-755HB in the shoulder, 1 x HS-475HB in the elbow, 1 x HS-422 in the wrist, and 1 x HS-422 in the gripper. The optional light weight wrist rotate uses 1 x HS-85BB. RIOS (Robotic arm Interactive Operating System) is a Windows program for controlling the AL5 series of Robotic Arms with our SSC-32 servo controller. With RIOS, your robot can be taught sequences of motion via the mouse or joystick. The inverse kinematics engine makes positioning the arm effortless. This extremely powerful program uses external digital and analog inputs to affect the robot's motion for closed loop projects. If-then, for-next, and do-while, are supported for the inputs. External outputs can also be controlled. This has been verified to work with an I/OGear USB to serial cable. If stand alone operation is desired, RIOS/SSC-32 can actually create the BASIC code to control the arm from our Bot Board and Basic Atom or Basic Stamp 2. Requires the purchase of a programming Starter Pack listed below. Note, DB9 Serial Data Cable included with AL5AC-KT. 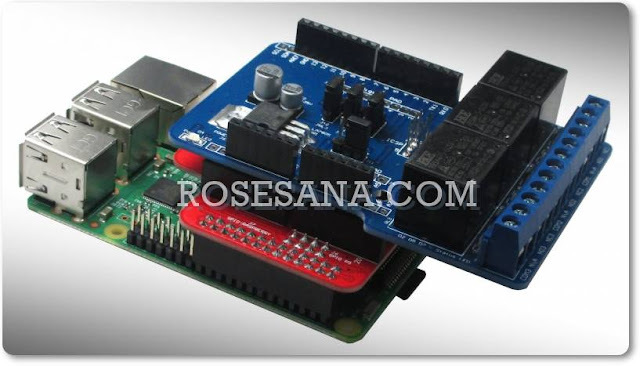 Alternately the servo motors can be controlled directly from a microcontroller. We sell the arm without servos and electronics for these options. With the addition of a GP2D12 sensor it is now possible to do experimental 3D image capturing with the latest version of RIOS. * Serial port-based version with powerful PC software. * Includes RIOS, a powerful interactive Windows program that uses external inputs to affect the robot's motion in closed-loop projects. * Advanced inverse kinematics positioning control using mouse or joystick. * Easily control from a Bot Board with Basic Atom or Basic Stamp 2, with the new BASIC code export function. * This product includes everything you need to control the arm from a personal computer. * Distance (base-to-elbow axis) = 3.75"
* Distance (elbow-to-wrist axis) = 4.25"
* Height (arm parked) = 6.00"
* Height (reaching up) = 14.0"
* Median forward reach = 5.75"
* Gripper opening = 1.25"
Build and program two SumoBot Robots designed to wrestle in the mini-sumo competition ring! The electronics consists of a surface-mounted BS2 module and an array of infrared sensors to detect your opponent and the edge of the Sumo Ring. Additional components include piezospeakers, resistors, pushbuttons and LEDs to build custom breadboard circuits for program mode selection and sensor state feedback. 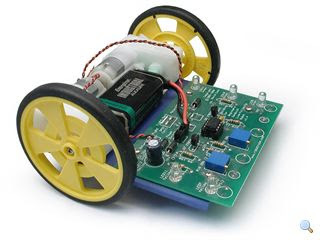 The hardware package includes black anodized aluminum chassis and scoops, servo motors, wheels, two battery packs (8 AA batteries not included), mounting standoffs, and screws for two complete robots. This kit comes with two printed texts. The SumoBot Manual has assembly instructions and test programs that take you from basic moves to one-on-one combat. When your bots are up and running, give them a competitive edge and expand your skills by following the step-by-step activities in Applied Robotics with the SumoBot - an advanced text in our Stamps in Class series. Activities include friction analysis, self-calibrating sensors, memory optimization with multipurpose variables and a sensor flags register, and state-machine diagrams for sensor-based navigation. EEPROM data logging lets you record your robot’s sensor and program states during a match, then display them afterward in the BASIC Stamp Editor’s Debug Terminal - an excellent way to troubleshoot and analyze the performance of your program strategies. Hold your wrestling matches on the durable 36 x 36 in. SumoBot Robot Competition Ring Poster, designed to use with the instructions and programs included in Applied Robotics with the SumoBot. 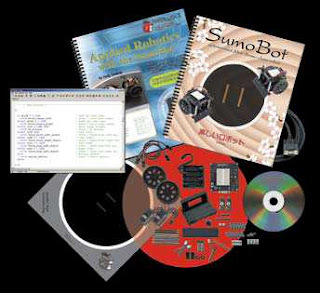 The SumoBot Robot Kit: Includes electronics, hardware and components for single robot, serial programming cable, and SumoBot Manual, Made by Parallax. NXP has developed the Mifare MF1 IC S50 to be used in contactless smart cards according to ISO/IEC 14443A. 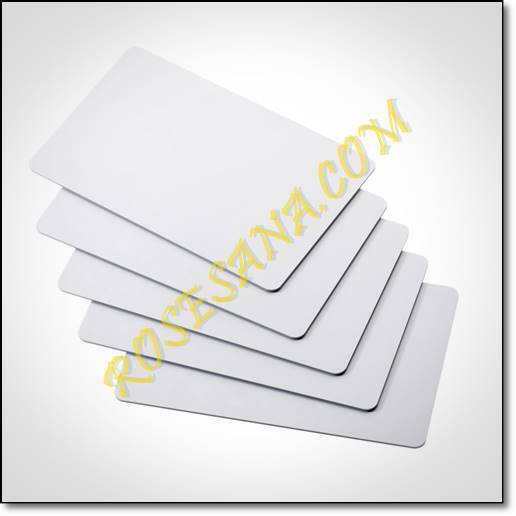 The Communication layer (Mifare RF Interface) complies to part 2 and 3 of the ISO 14443A standard. The security layer sports the field proven CRYPTO1 stream chiper for secure data exchange of the Mifare Classic family. The Mifare MF1 IC S50 is connected to a coil with a few turns and then embedded in plastic to form the passive contactless smart card. No Battery is needed. When the card is positioned in the proximity of the READ WRITE device antenna, the hig speed RF communication allow to transmit data with 106 kBits/second. Adding new powerful feature to this blog. Google's research group has developed its own statistical translation system for the language pairs now available on Google Translate. It's translation produced by state-of-the-art technology, without the intervention of human translators. Automatic translation is also often referred to as machine translation. Most state-of-the-art, commercial machine-translation systems in use today have been developed using a rule-based approach, and require a lot of work to define vocabularies and grammars. The Tank Tread Kit (#28106) gives your Boe-Bot robot the ability to traverse unfriendly terrain. Simply remove the wheels and attach the gears and treads. The Crawler Kit (#30055) attaches easily to your Boe-Bot and runs on standard Boe-Bot source code with only minor adjustments for ground speed. Sample PBASIC code available online. 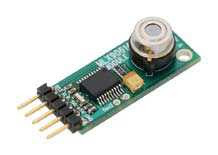 The MLX90614 module is an intelligent infrared temperature sensor for serial connection to the BASIC Stamp. Communication with the MLX90614 is handled through a bi-directional serial connection on any selected pin of the BASIC Stamp. 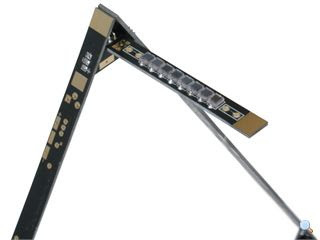 This module mounts directly on a circuit peg board or connection socket and can sense and measure surface temperatures without surface contact. 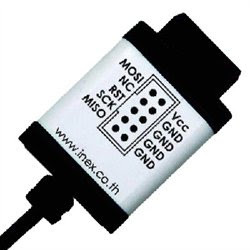 Sensor inputs may operate under software or hardware control. The Parallax AppMod communications protocol is used, allowing baud rates of 9600, 19,200 and 38,400 baud. 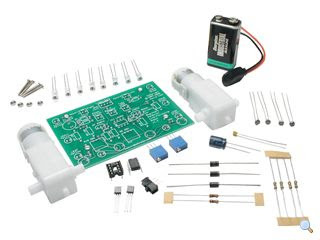 This kit comes complete with all electrical components necessary to build a fully functional Sandwich robot (minus the batteries and molex headers.) Another item you may want to get is some Sintra to build all your base with.We include a printout from the support website that details the construction process. 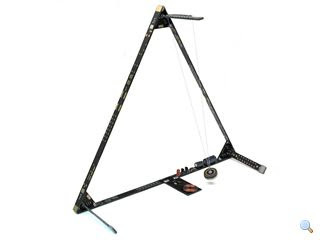 The SunSwinger uses the unique BEAM "force-coil" circuit (as described in the pendulum project from our book "Junkbots, Bugbots, and Bots on Wheels") to make a magnet swing under the arms of an attractive triangular frame. It's designed to work primarily from solar energy, but can be powered by practically any household battery or DC power supply (useful when you live in a dark cave!). The SunSwinger is very flexible in how you can put it together. Solar cells can be mounted in several places; the pendulum length can be as long as you desire; you can make the magnet stationary and swing the circuit if you wish! It's a neat device. We've built several and put them up on high window ledges. It drives cats crazy too. Good thing it's a pretty tough device! Magbot "SunDancer" BEAM Butterfly. 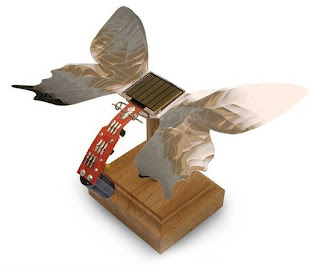 This kit lets you build a mechanical-looking butterfly or insect that makes an ideal executive desk toy. The Magbot SunDancer Butterfly works on almost the same circuit as the SolarSpeeder Kit, but instead of dumping the power through a motor, it dumps it through a coil. Since the Magbot is balanced on a stand above a high-intensity magnet, it rocks on its own self-induced "electromagnetic wind". The silver/gold wings then shine and reflect the embossed wing patterns all over the ceiling. It's a kit that is only slightly more complex than the SolarSpeeder kit, and comes with an oak stand, silver/gold mylar wing material (you choose the final colour and wing pattern), all components, and one of our very well documented instruction sets. The Inex USB AVR-ISP Programmer operates with the AVR Program software (included on CD-rom in the “tools” menu) and works with the Avr-OspII software as well. The PX-4000 program AVR microcontrollers via an ISP connector. • Connects to the computer’s USB port. • Supports Read, Write, Erase and Protection functions. • Requires +5V power supply from target/master board.